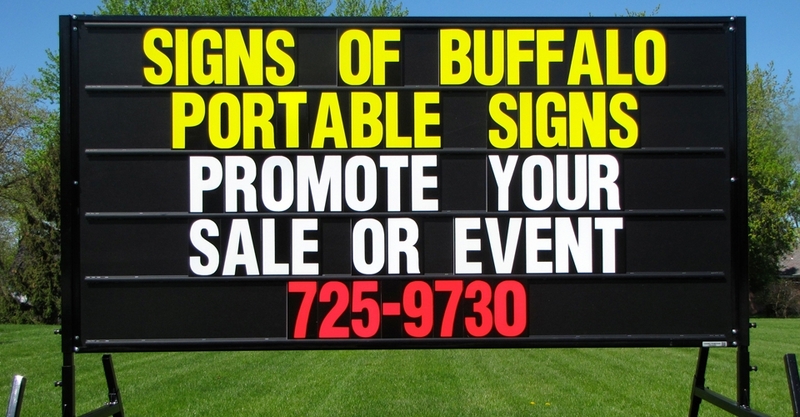 Signs of Buffalo is a locally owned and operated portable sign rental company. We rent 4’ x 8’ black portable signs to those in various Buffalo locations, including the north and south towns. Our service area reaches from Grand Island, Tonawanda, Amherst, Clarence, Buffalo, Cheektowaga, Depew, Lancaster, Elma, West Seneca, Lackawanna, Orchard park, and Hamburg. At Signs of Buffalo we understand our customers’ need to promote their business or event in an easy, cost-effective manner. Our roadside portable signs are the most economical, cost-effective way to get your message out to your targeted market. We have worked with businesses and organizations throughout Erie County to provide professional, high visibility signs that will attract customers to your business or event. We rent only black signs with bright white, yellow, and red lettering because they are simply the most attention grabbing, readable signs. They are bolder, brighter, and easier to read than the old-fashioned back lit signs. Signs of Buffalo realizes a sign promoting your sale, event, or fundraiser is a direct reflection of your company or organization. Signs of Buffalo guarantees a high quality, well-maintained sign for businesses. Signs of Buffalo has unique knowledge of the Western New York area, and we make you confident in our ability to get your message out to a large audience. You will be pleased with your business’s return on investment with our outdoor roadside signs. Your sign is not working if it does not attract potential customer’s attention quickly. Signs of Buffalo’s portable signs are the most attention grabbing, readable signs. Signs of Buffalo is available every day to take your call and answer any questions you may have. We also deliver and pick up signs on any day of the week. We want to make advertising your sale or event to be as convenient as possible for you. For more information on portable sign rentals contact us today at (716)725-9730.